Gregg Roman, Ph.D., is a professor and chair of the Department of Biology at the University of Mississippi. He has an M.S. in genetics from the University of New Hampshire and a Ph.D. in cell and molecular biology from the University of Pennsylvania. Roman was a faculty member at Baylor College of Medicine and the University of Houston before joining the University of Mississippi in 2016. His laboratory at UM is investigating the cellular and molecular mechanisms of behavioral plasticity, including how the brain adapts to high levels of alcohol. Intoxicating levels of alcohol leads to tolerance within the brain, which is a critical step toward developing an addiction to this drug. Roman is investigating this process utilizing genetic, physiological, and behavioral approaches with the model system Drosophila melanogaster. 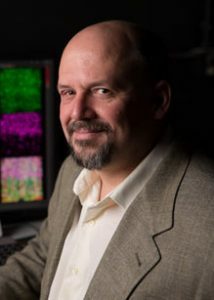 He has won several awards for his research, including the Dean Scholar Award from the University of Pennsylvania, the Phillip O’Bryan Montgomery Fellowship from the Damon Runyon-Walter Winchell Cancer Research Fund, the Henry and William Test Investigator of the National Alliance for Research on Schizophrenia and Depression, and the Distinguished Scholar and Lifetime Member Award of the National Society of Collegiate Scholars.